In each group of hotels, we've started our numbering with "1," as you'll see below. This long-established hotel is less than a minute from the Rialto Bridge. 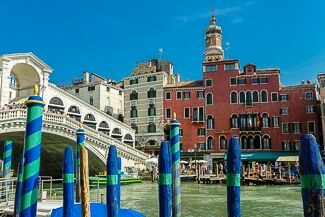 It's also extremely close to the Rialto airport-boat and vaporetto platforms, although you'll need to cross the Rialto Bridge to reach them. Click here for walking directions, or see Hotel Marconi at Booking.com. The Magic Rialto occupies a floor in the same building as the Hotel Marconi (see above), and its entrance is right next to the hotel. Just look for the glass door with a wrought-iron grille and a brass nameplate by the doorbell. The guesthouse has a simple, basic decor, and bathrooms are shared. Accommodations include singles, doubles, twins, triples, and a two-bedroom apartment that sleeps five. Click here for walking directions to the Hotel Marconi next door, and see Magic Rialto at Booking.com. The Locanda Sturion is a "residenza d'epoca," a term for hotels and guesthouses in structures of historic importance. Its building has housed an inn, on and off, since the 13th Century. The Locanda is on the third floor without a lift, but if you don't mind climbing stairs with your luggage, you'll be rewarded with wonderful views of the Rialto Bridge and the Grand Canal from the hotel's lounge, breakfast tables, and junior suites. Click here for walking directions, or see Antica Locanda Sturion at Booking.com. This upmarket guesthouse has only six rooms, which overlook the Grand Canal or the entrance garden. (There's also a double room with a private terrace.) If that isn't enough, you can step out onto Ca' Angeli's private water landing to watch the passing boat traffic or find something to read in the small lounge-library that faces the Canal Grande. Note: Although it's possible to take the Alilaguna Orange Line airport boat to Rialto, cross the bridge, and walk through back streets to Ca' Angeli, we don't recommend it unless you're traveling light. Nearest airport-boat and vaporetto stop: San Silvestro. For more photos, rates, and reviews by paying guests, see Ca' Angeli at Booking.com. The Palazzo Barbarigo is a four-star boutique hotel in the 16th Century palace of the same name. It has 18 rooms and suites, all decorated in Art Deco style, with views of either the Grand Canal or the Rio San Polo, a canal that runs alongside the hotel (inset at left). The hotel's public rooms include a stylish bar and a comfortable lounge. 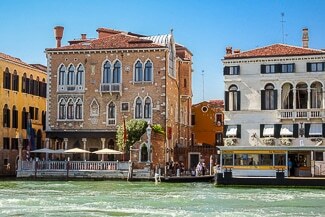 A water entrance opens onto the Grand Canal, where you can arrive by water taxi. Another option, if you don't have too much luggage, is to take the often-crowded No. 1 vaporetto to San Tomà and walk from there (see map). Nearest vaporetto stop: San Tomà. For more photos, rates, and reviews by paying guests, see Hotel Palazzo Barbarigo sul Canal Grande at Booking.com. The Palazzo Stern is a wonderful choice if you're arriving or departing from Venice Marco Polo Airport, because the Alilaguna Linea Arancio airport boat stops at Ca' Rezzonico, right next to the hotel. Step off the boat, bear left, and you'll be at the hotel entrance before you can say "That was quick." The Palazzo Stern also has a panoramic rooftop terrace with a hot tub that you can reserve, and a choice of 24 Venetian-style rooms and suites (all with kettles for making tea or coffee, an amenity that isn't common in Venice). Nearest airport-boat and vaporetto stop: Ca' Rezzonico. Click here for walking directions, or see Hotel Palazzo Stern at Booking.com. Although there are no Alilaguna airport-boat stops close by, a vaporetto station is near the hotel. Also, the hotel's entrance is easy to find: Just look for the hanging illuminated sign on the Rio Terà Antonio Foscarini, a street that leads inland from the square by the bridge and the Accademia art museum. Arrival and departure: Vaporetto or water taxi. Click here for walking directions, or see Hotel Galleria at Booking.com. 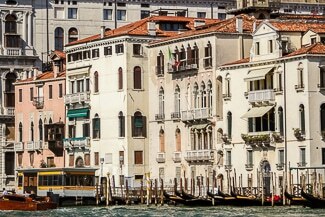 This outstanding luxury hotel (located just to the right of the Salute Church in the photo above) is ideal if you're looking for a place to stay amid the palazzi of the eastern Dorsoduro district, near the point where the Grand Canal feeds into St. Mark's Basin. The hotel is close to several major art museums (including the Peggy Guggenheim Collection) and just one small bridge away from the Basilica of Santa Maria della Salute. The neo-Gothic 19th Century palazzo has 50 rooms and suites that range from 20 square meters to a massive 150 m² in size. 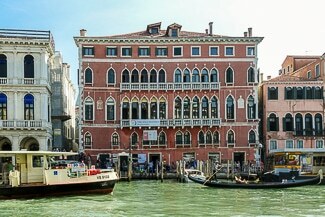 All have views of either the Grand Canal or the hotel's quiet and attractive courtyard. 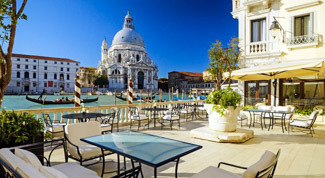 The hotel's other amenities include a bar and restaurant, with outdoor tables on a deck facing the Grand Canal during the summer months, plus a small gym under the palazzo's roofbeams. Arrival and departure: Water taxi, vaporetto, or Alilaguna Orange Line airport boat. Click here for walking directions, or see Hotel Sina Centurion Palace at Booking.com. For location, the Hotel Rialto is an appealing choice: It's at the foot of the Rialto Bridge and close to the Rialto waterbus platforms, which are served by public vaporetti and airport boats of Alilaguna's Linea Arancio (lower inset photo). The Piazza San Marco is easy to reach on foot from the hotel. The Hotel Rialto offers a variety of well-equipped rooms (some overlooking the Grand Canal), plus the option of an "executive apartment" in a separate location nearby. 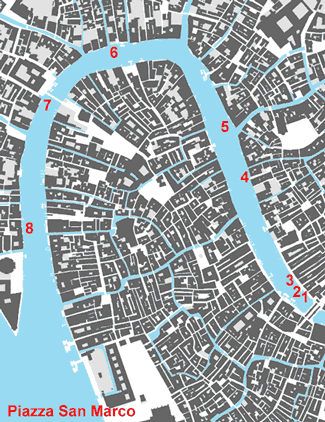 Note: This is a very busy area of Venice. During high season, expect crowds and occasional noise at night. Click here for walking directions, or see Hotel Rialto at Booking.com. The Palazzo Bembo on the Grand Canal is an upscale bed-and-breakfast on the top floor of a 15th Century Venetian Gothic palace (now an art exhibition space) near the Rialto Bridge. The location couldn't be more convenient: It's right behind the Alilaguna Orange Line airport-boat pier. Click here for walking directions, or see Palazzo Bembo at Booking.com. Some of the NH Palazzo Barocci's superior rooms and junior suites overlook the Grand Canal. Many of the rooms have electric kettles, and the more expensive rooms and suites have espresso machines. Other amenities include a bar and a garden where breakfast is served during the warmer months. 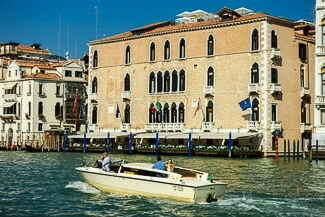 Click here for walking directions, or see NH Collection Venezia Palazzo Barocci at Booking.com. Like its neighbor, it couldn't be more convenient to reach by Alilaguna's Linea Arancio water bus from Venice Marco Polo Airport: Just step off the boat at Sant'Angelo, turn right, and walk a few steps along the water to the hotel entrance. The hotel has a good range of rooms and suites, plus an American bar and a free shuttle boat to Antonio's Lounge and Restaurant at the five-star Hotel Sina Centurion Palace. Click here for walking directions, or see Sina Palazzo Sant'Angelo at Booking.com. The Foresteria Levi is close to the Campo San Stefano (one of Venice's largest and liveliest squares) and the Accademia Bridge. You can walk to it fairly easily from the Santa Maria del Giglio vaporetto stop, which is used by Alilaguna's Linea Arancio airport boats, if you have a decent map and aren't traveling with too much luggage. If you're willing to splurge on a water taxi, getting to the Foresteria is even easier. Arrival and departure: Water taxi, Alilaguna Orange Line airport boat, or vaporetto. Nearest vaporetto stop: Santa Maria del Giglio or Accademia. For more photos, rates, and reviews by paying guests, see Foresteria Levi at Booking.com. The Palazzetto Pisani Boutique Resort offers a wide range of beautifully-furnished accommodations, ranging from double rooms to spacious suites (some with canal views). A dining room and bar are in the main building. Nearest airport-boat and vaporetto stop: Santa Maria del Giglio. For more photos, rates, and reviews by paying guests, see Palazzetto Pisani Grand Canal at Booking.com. This small boutique hotel has an incredibly convenient location: It overlooks the Grand Canal from the top floor of a palazzo, and the entrance is just down the street from the Santa Maria del Giglio vaporetto stop (which is also used by airport boats of Alilaguna's Linea Arancio). From the hotel, it's an easy walk to the Piazza San Marco, the Doge's Palace, the Rialto Bridge, and Venice's most upscale shops. Click here for walking directions, or see Locanda de la Spada at Booking.com. 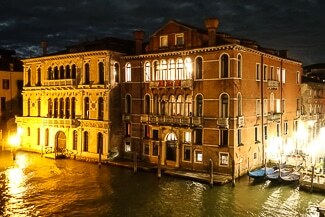 The Gritti Palace is one of Venice's top luxury hotels, and it's by far the most prestigious hotel on the Grand Canal. It occupies the whole of a 15th Palazzo and offers a plethora of rooms, suites, and services--including a fine-dining restaurant, a waterside terrace, an elegant bar, a spa, and a 24-hour gym. If you're staying here, you'll probably arrive by water taxi, but the Alilaguna Linea Arancio airport boat's Santa Maria del Giglio stop is only a couple of minutes away over level ground. 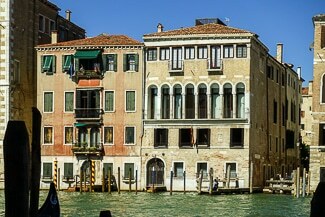 You can also board a gondola or a traghetto gondola ferry across the Grand Canal from the piers next to the hotel entrance. 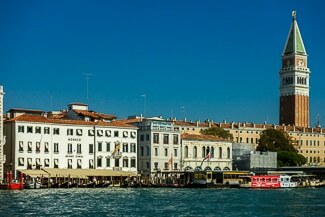 Click here for walking directions, or see The Gritti Palace at Booking.com. Arrival and departure: Water taxi, Alilaguna Blue Line airport boat, or vaporetto. Nearest airport-boat stop: San Marco Giardinetti. Click here for walking directions, and watch this space for a future link to the hotel after it has reopened. 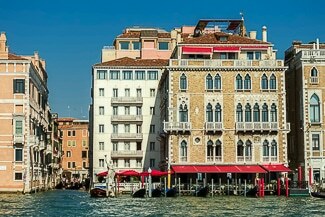 The Bauer Venezia has two connected properties: The five-star Hotel Bauer (1930s-era white building above) and the even more luxurious Bauer Palazzo, in an historic palace that's directly on the Grand Canal. Accommodations in both buildings are deluxe, as you'd expect, with rooms that range from well-appointed doubles and twins to a Royal Suite (billed as "the favorite choice of VIPs and royal families"). You'll find plenty of amenities and services, including restaurants, bars, and a guests-only "Seventh Heaven" breakfast room on the 7th floor where you can sit on an outdoor terrace in good weather. The hotel also has a spa and fitness center, with a personal trainer on duty five days a week. Chances are, you'll arrive by water taxi, but the hotel is easy to reach (with no bridges to cross) from Alilaguna's Blue Line airport-boat stop near the Piazza San Marco. Click here for walking directions, or see Bauer Palazzo Hotel at Booking.com. 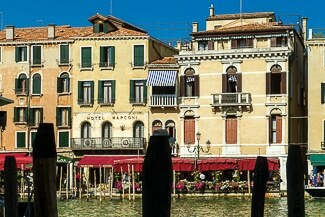 This long-established hotel is extremely close to the Piazza San Marco. 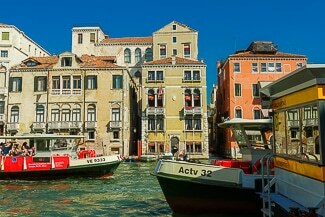 It's also just a minute or two away from the San Marco Giardinetti vaporetto station, which is used by Alilaguna Linea Blu water buses from Venice Marco Polo Airport. Note: The hotel's land entrance is in the Calle Vallaresso, just beyond Harry's Bar. Arrival and departure: Alilaguna Blue Line airport boat, water taxi, or vaporetto. 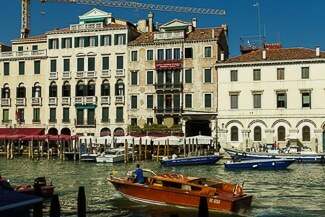 Click here for walking directions, or see Hotel Monaco & Grand Canal at Booking.com.